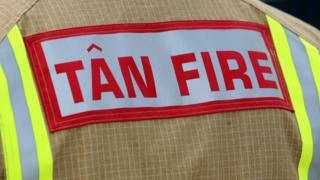 Firefighters are dealing with a large mountain fire in Denbighshire which broke out on Wednesday evening. About two hectares (five acres) of heather is alight along the Panorama Walk below the Eglwyseg escarpment, above Llangollen. The area is a Site of Special Scientific interest. The fire is ongoing, with firefighters from Llangollen, Wrexham, Buckley and Chirk using hosereel jets and beaters to try to control the blaze.